Hey friends! I just announced my long-term travel plans on social media and to my beloved email subscribers. 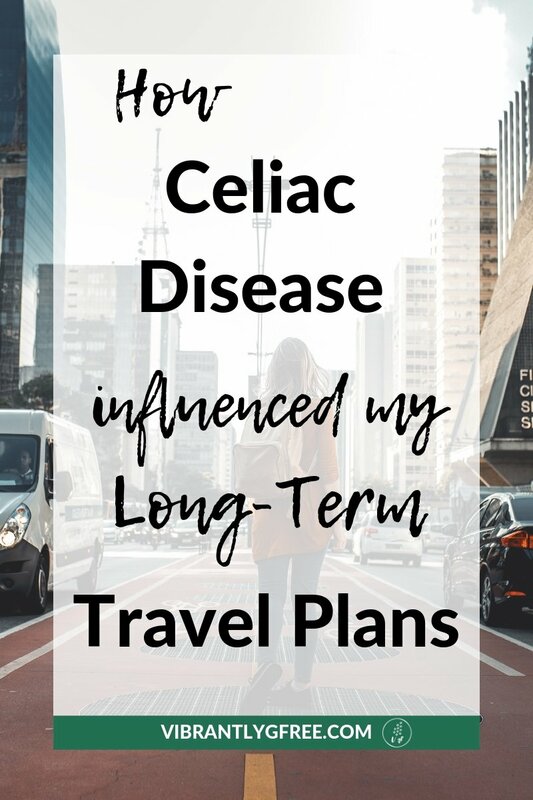 I am so excited for this adventure, and I want to share how celiac disease played into my decision to quit my job and travel long-term. There are more updates coming soon, so stay tuned for where I’m headed and how long I’ll be away. 1. Having any health condition can be a wake-up call that your life can change at any moment. This was a big one for me. When I was finally diagnosed, I was very, very sick. We’re talking 3 weeks in bed, can’t go to work sick. And I was only 24. Before we found out it was celiac, however, my health was rapidly declining, getting worse on the BRAT diet (well that’s an obvious conundrum now), and no one knew what it was. The next round of testing would have been for stomach cancer. While this story has a happy ending, the experience taught me to never take my health for granted. I want to travel, explore, and live life to the fullest every moment that I can. 2. Gluten-Free food is becoming more widely available! I am shocked by how many gluten-free products are on the shelves at my local grocery store these days! 7 years ago, I had to shop at specialty markets. Now it seems everyone has something I can eat. I rode my bicycle from Seattle to San Francisco 2 years ago, and I was pleasantly surprised by how many small, local grocery stores had gluten free foods. My travel and international social media friends helped me to discover that this is a growing trend globally. While I have no expectation to find gluten free food and awareness everywhere, I’m confident that I will never go too long before finding safe and delicious gluten free options. 3. Making your own gluten-free food means healthy eating while traveling. Travel food can wreak havoc on our bodies if we aren’t watching what we eat. Travel days, airport food, and nights with little sleep can all lead us to choose foods that underserve our active bodies. Celiac causes me to think about my food ALL the time, and healthy whole foods are mostly gluten free. I am always paying attention to the foods that fuel my body and the effect they have on my health and energy levels. However, when I come to a 100% gluten free restaurant, all bets are off! 4. I can provide Travel inspiration and information for other gluten-free eaters. I actually started this blog as a way to hold myself accountable to some lofty travel plans. I had NO idea that anyone would find my blog, or that some people would find my advice helpful. I still have only a vague understanding (and a hilarious story) about how my blog was ‘discovered’, but I’m really glad it was. Other gluten free travel bloggers and instagrammers inspire me with possibilities while living with a strict gluten-free diet. I hope to repay the favor with my own travel stories and lifestyle tips. The biggest takeaway I learned from the process of evaluating my limitations for long-term travel is that my trip doesn’t need to look like anyone else’s. People who can eat anything pass judgement about the locations in my itinerary, but the truth is that they haven’t taken the leap to travel and they certainly don’t have any right to judge my trip. I maintain the belief that gluten-free eaters can travel anywhere, and that all destinations can be gluten-free-friendly with a little creativity and motivation. However, my particular style of travel for this trip requires a little extra risk, is a bit slower, and doesn’t account for much luggage (this is the topic of a future post). 1. Due to limited availability of gluten free foods, eating with celiac disease requires more planning. This is a significant challenge for any gluten-free traveler. With rural destinations in mind, it will be difficult for me to travel to a specialty foods store when local stores don’t stock gluten-free items. For now, my solution is to very carefully research the first few months of my trip ahead of time (using my Gluten Free Travel Planner – get yours below!) and stay a few months ahead on research so there is time to change plans if needed. With that in mind, I think flexibility to change is a super important quality for any traveler, particularly if you’re gluten-free! 2. Long-term travel is a committing decision. If eating safely on the trip were to go poorly, I could choose to shorten my trip and head home. However, it would be incredibly disheartening. I made a lot of sacrifices to make this trip work and I have no intention of bailing if things get tough. I do have plans to adjust the destinations and style of travel if need be, and I’ll make this point more clear in a future post. 3. I’m a sensitive celiac and have other food intolerances as well. This one is a real kicker for me. At this point, I feel very comfortable explaining and advocating for my gluten-free diet. But I also can’t eat bananas and oats, and I need to limit my consumption of dairy, corn, and sugar. Just writing that down makes me feel high-maintenance but my body really does not function well with these foods and demands that I respect its needs. To combat this challenge, I’ll bring my DIY Celiac Kitchen Kit for safe eating while traveling. I’m also very, very fortunate and grateful to have a spouse who is really supportive and understands my needs. He has crohn’s disease, and has been my support group buddy since the whole celiac journey began. 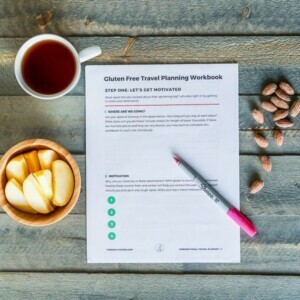 Get a FREE packing list and access to our Free Resource Library created especially for gluten-free travelers! 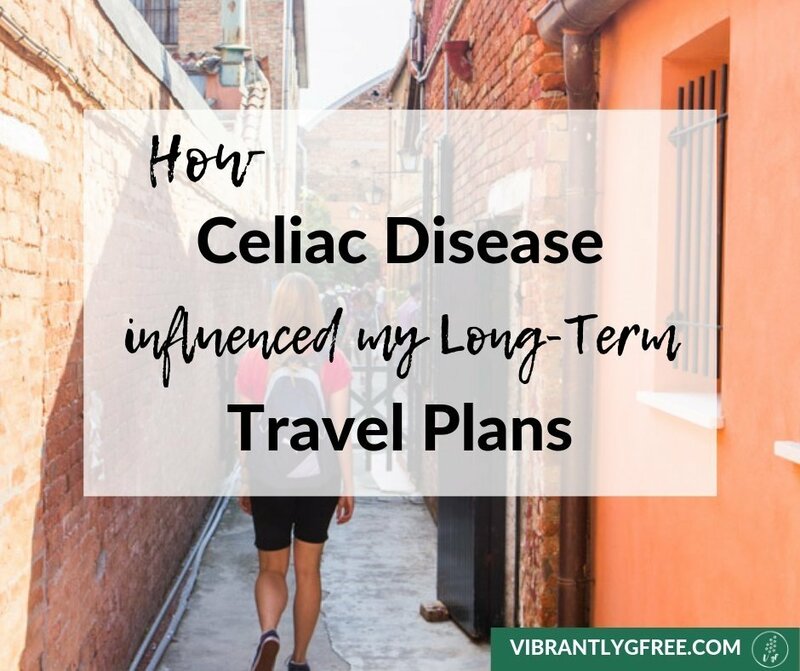 Realizing how celiac disease could be a long-term travel motivator was empowering as a gluten free traveler. While there are still many challenges to navigate, I wonder if I would have made the leap if I didn’t have that extra push.